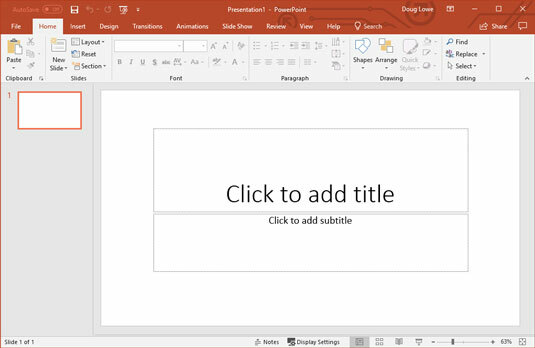 When you start PowerPoint 2019, it greets you with the screen shown here. This screen lets you create a blank presentation, open a recently used presentation, or create a new presentation based on a template. 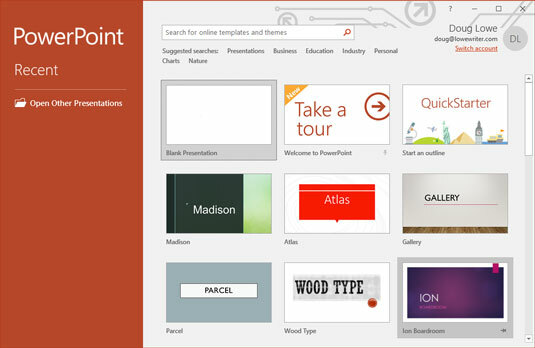 You can also take a video tour of PowerPoint. Click Blank Presentation to get started with a new presentation. You will next be greeted with a screen that’s so cluttered with stuff that you’re soon ready to consider newsprint and markers as a viable alternative for your presentations. The center of the screen is mercifully blank, but the top part of the screen is chock-full of little icons and buttons and doohickeys. What is all that stuff? Ribbon: Across the top of the screen, just below the Microsoft PowerPoint title, is PowerPoint’s main user-interface gadget, called the Ribbon. If you’ve worked with earlier versions of PowerPoint, you were probably expecting to see a menu followed by one or more toolbars in this general vicinity. After meticulous research, Microsoft gurus decided that menus and toolbars are hard to use. So they replaced the menus and toolbars with the Ribbon, which combines the functions of both. The Ribbon takes some getting used to, but after you figure it out, it actually does become easier to use than the old menus and toolbars. The deepest and darkest secrets of PowerPoint are hidden on the Ribbon. Wear a helmet when exploring it. Note that the exact appearance of the Ribbon varies a bit depending on the size of your monitor. On smaller monitors, PowerPoint may compress the Ribbon a bit by using smaller buttons and arranging them differently (for example, stacking them on top of one another instead of placing them side by side). File tab: The first tab on the Ribbon is called the File tab. You can click it to switch the program into a special mode called Backstage View, which provides access to various functions such as opening and saving files, creating new presentations, printing, and other similar chores. Quick Access toolbar: Just above the Ribbon is the Quick Access toolbar, also called the QAT for short. Its sole purpose in life is to provide a convenient resting place for the PowerPoint commands you use the most often. Initially, this toolbar contains just three: Save, Undo, and Redo. However, you can add more buttons if you want. To add any button to the QAT, right-click the button and choose Add to Quick Access Toolbar. You can also find a pull-down menu at the end of the QAT that lists several frequently used commands. You can use this menu to add these common commands to the QAT. Slides pane: To the left of the slide is an area that shows thumbnail icons of your slides. You can use this area to easily navigate to other slides in your presentation. Task pane: To the right of the slide is an area called the task pane. The task pane is designed to help you complete common tasks quickly. When you first start PowerPoint, the task pane isn’t visible. However, it appears whenever it’s needed, and you can see plenty of examples of it throughout this book. Status bar: At the very bottom of the screen is the status bar, which tells you the slide that is currently displayed (for example, Slide 1 of 1). You can configure the status bar by right-clicking anywhere on it. This right-click reveals a list of options that you can select or deselect to determine which elements appear on the status bar. Zoom control: PowerPoint automatically adjusts its zoom factor so that Slide View displays each slide in its entirety. You can change the size of your slide by using the zoom control slider that appears at the bottom right of the window. You’ll never get anything done if you feel that you have to understand every pixel of the PowerPoint screen before you can do anything. Don’t worry about the stuff that you don’t understand; just concentrate on what you need to know to get the job done and worry about the bells and whistles later.